Rowlinson Corner Potting Store: Offers a duel function allowing you to pot and grow in the greenhouse section whilst giving you a large storage area in the shed section. 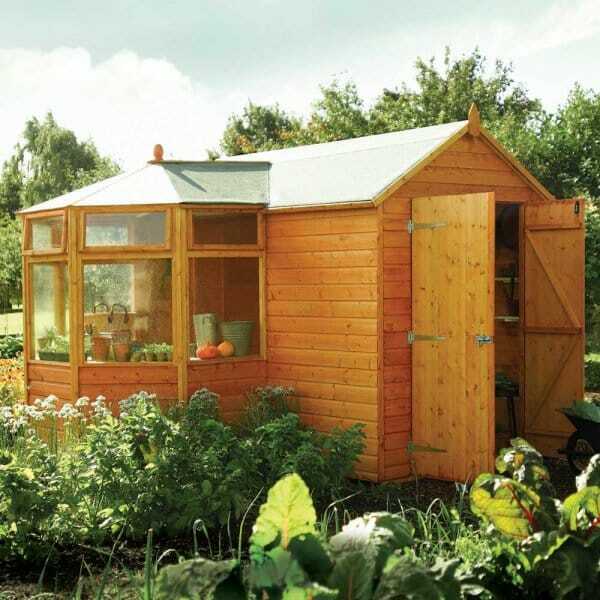 Includes the greenhouse staging and features plenty of glazed area to really encourage seedlings and growth. Can easily fit into right angle corners and can be built either as shown or mirrored i.e. so it fits into opposite corners. It features 3 opening windows to ensure plenty of ventilation and three clear styrene roof panels for extra light. Review Title - The only reason this did not get five stars was that there was no communication as to when the shed was going to be delivered, it just turned one day lucky we were around. other then that never seen such a well packaged item and every thing was there nothing missing. you must read the instructions, then read them several more time prior to starting erection the instructions are good but remember this is not a four sided shed. would i buy anouther one yes just keep us informed of the progress of the order. The only reason this did not get five stars was that there was not enough communication as to when the shed was going to be delivered - we were called one day and it turned u the next day lucky we were around. other then that never seen such a well packaged item and every thing was there nothing missing. you must read the instructions, then read them several more time prior to starting erection the instructions are good but remember this is not a four sided shed. would i buy anouther one yes just keep us informed of the progress of the order.